Grafene Tasting eXperience 5 Dish Vegetarian. SOLD OUT! 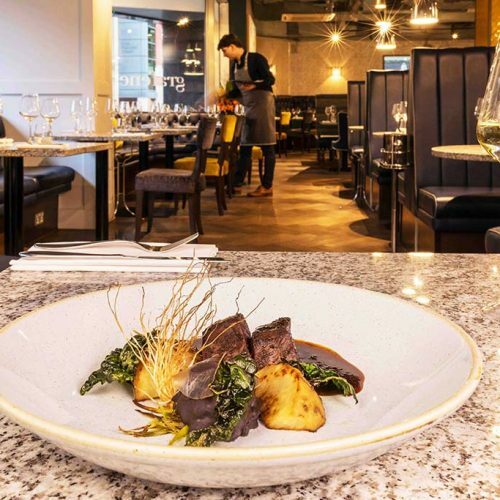 Executive chef Ben Mounsey at Grafene restaurant Manchester has created a 5-course tasting menu that celebrates the best of British ingredients, alongside some of the region’s finest producers. 5 Dish Vegetarian Tasting Menu Selection £40pp. 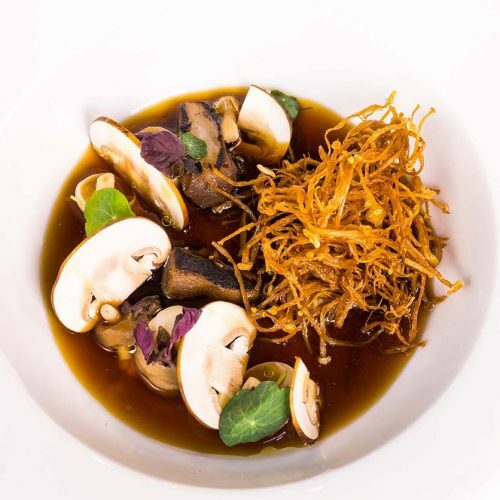 Ben’s menu is a clear celebration of flavour and quality ingredients. His interpretation of dishes brings with it unique elements. Ben takes your perceptions of British classics and familiar food; turning them on their head. Reconstructing dishes with unique combinations. Taking risks. Challenging the traditional rules of fine dining. The result is exciting. 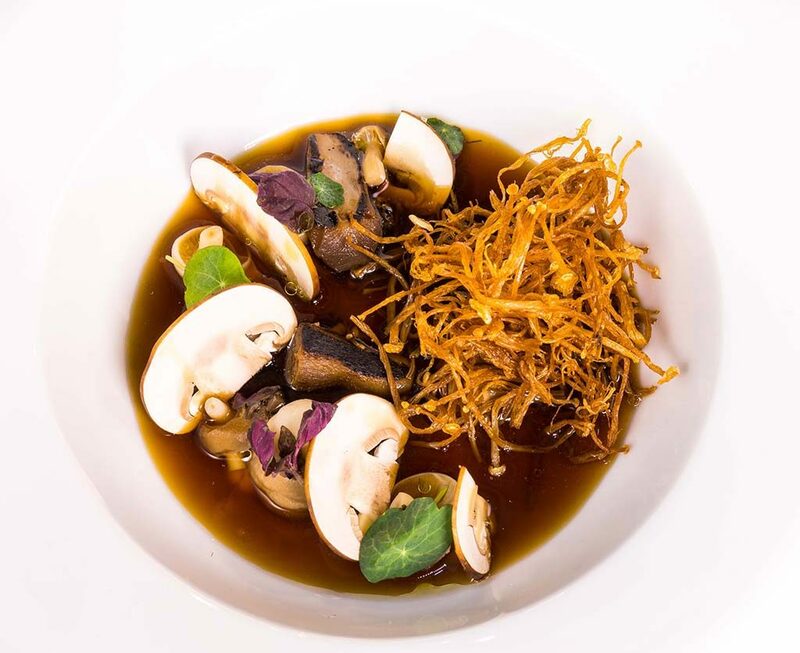 Dishes you will want to discover; all prepared with a high level of attention to detail and yet presented with intended simplicity. 5 Dish Vegetarian Tasting Menu Selection. 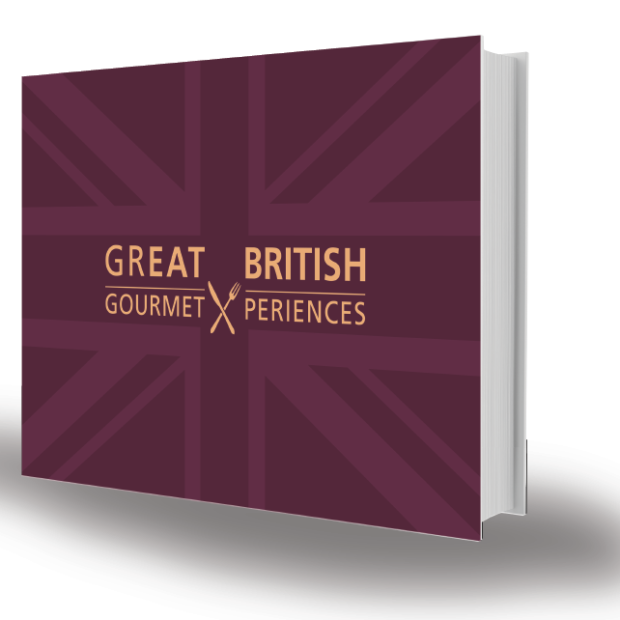 This GourmetXperience is totally eXclusive: Welcome English sparkling wine or British Seasonal cocktail + Five British cheese selection. Total eXtras added value = £15pp. Each guest receives all elements listed. Available Sunday-Thursday Dinner. Lunch on special request. To be enjoyed by the whole table. Min 2. Max 6. A luxurious, urban space in the heart of Manchester city centre, Grafene offers a spacious dining room, island bar serving a collection of ‘experimental’ cocktails, two private dining rooms and an al fresco dining area. 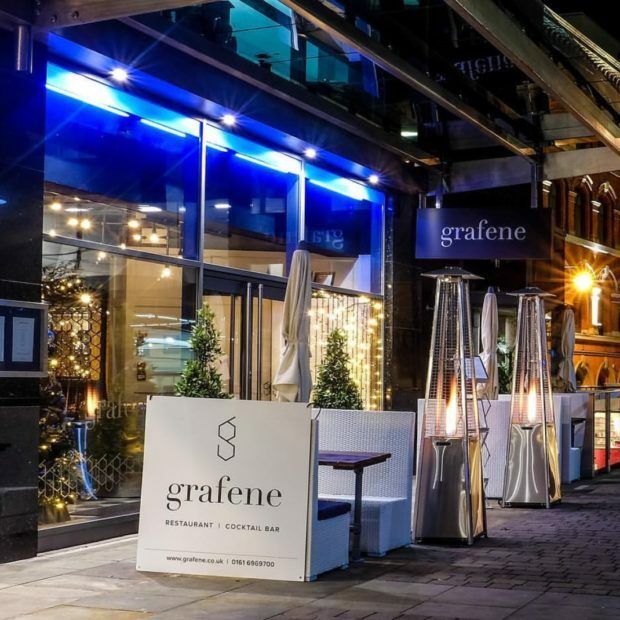 An informal style married with a meticulous attention to detail and a vibrant atmosphere; Grafene is a popular destination for regular lunch dining, stylish dinners and celebration events. 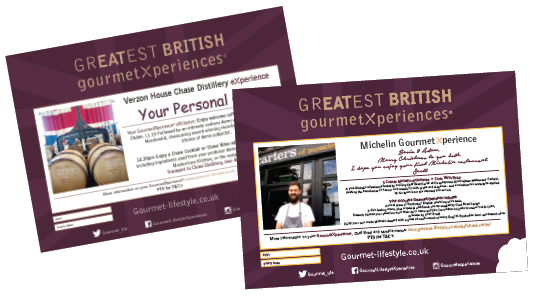 Menus consist an a la carte, alongside a ‘5 to Taste’ and ‘7 to Taste’ tasting menus, British Tapas at lunchtime and early evening, and a Bar Bits menu. 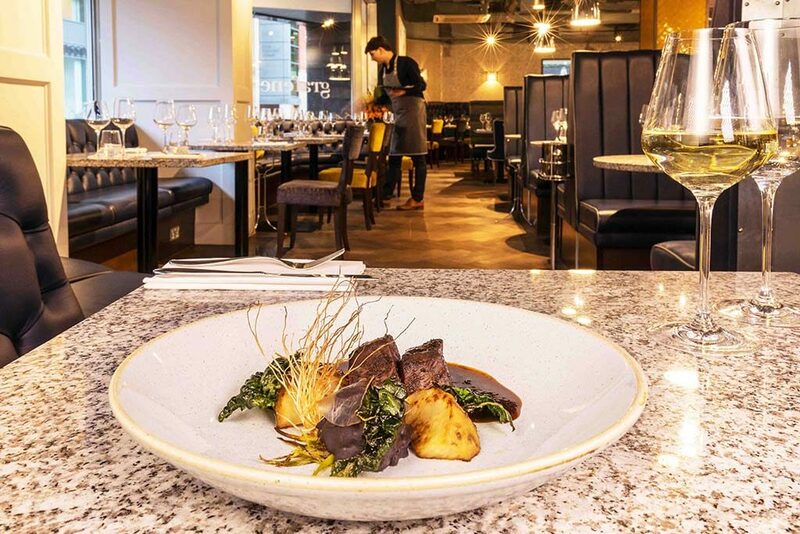 Grafene offers creative British dining in the heart of Manchester, with a stylish-urban setting in which to experience the authentic food of chef, Ben Mounsey. The menu is his reflection of modern British life. Infused with inspiration from his region – and what he feels it means to live in the North West. Dishes on his menu include cleverly reconstructed classics, but also plates to challenge a diner’s perception of familiar foods. He delivers dishes with unexpected flavour twists – and a nod to his sense of humour and fun. The menu avoids the obvious. 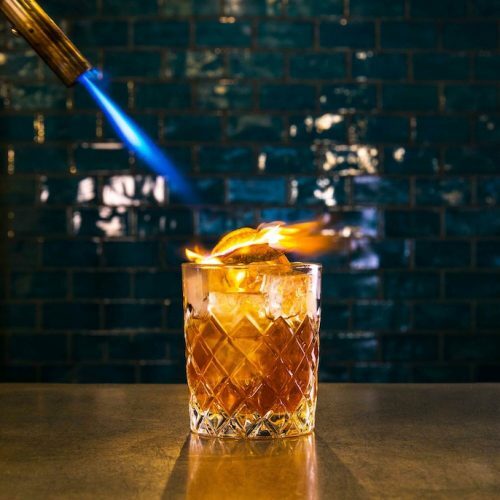 The result is a celebration of the best ingredients sourced locally and from across the UK; presented with a meticulous attention to detail and purposeful simplicity. 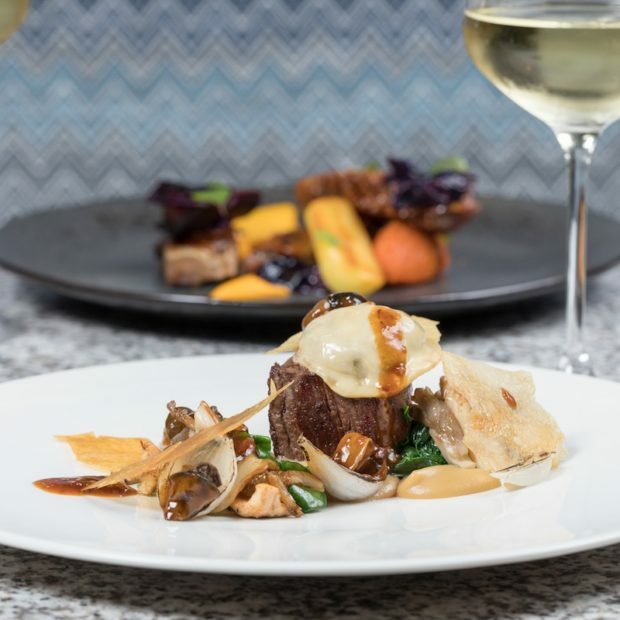 The a la Carte, tasting menus and British Tapas selections are all served in the relaxed atmosphere of the restaurant, whilst an open pastry kitchen in the heart of the restaurant offers a visual and entertaining experience. 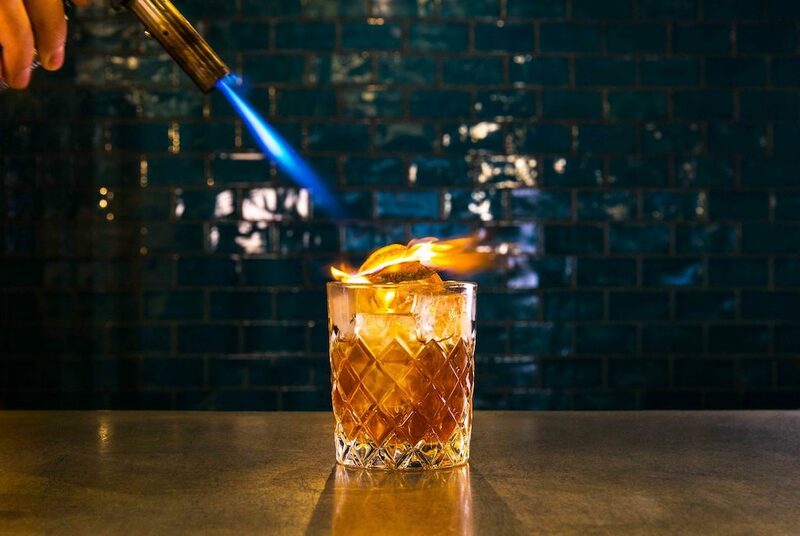 The island bar serves vintage champagne, local beers and creatively-crafted cocktails. Two intimate private dining areas specialise in wine tasting, business events or as a dedicated activity tailored to each party. The urban-luxe interior of the venue is complemented by an al-fresco dining area on the thoroughfare between King Street and Chapel Walks. So – why call it Grafene? : “We are inspired by the world’s first 2D material Graphene, first isolated at Manchester University,” said owner Paul Roden. Also visit their sister venue Losehill House, Boutique Hotel & Spa in the Derbyshire Peak District. Under the direction of Head Chef, Ben Mounsey who recently took the culinary helm. 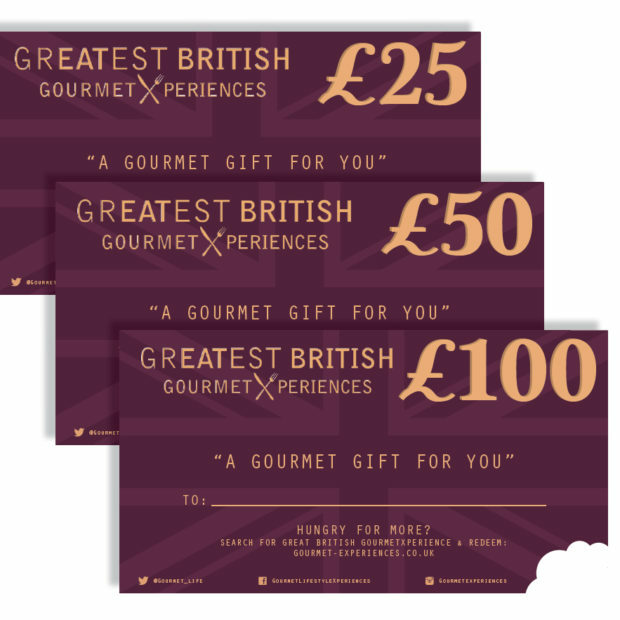 His menus offer Ben’s interpretation of fine, contemporary British food. To run alongside this, a cocktail collection featuring newly-crafted drinks has been introduced. 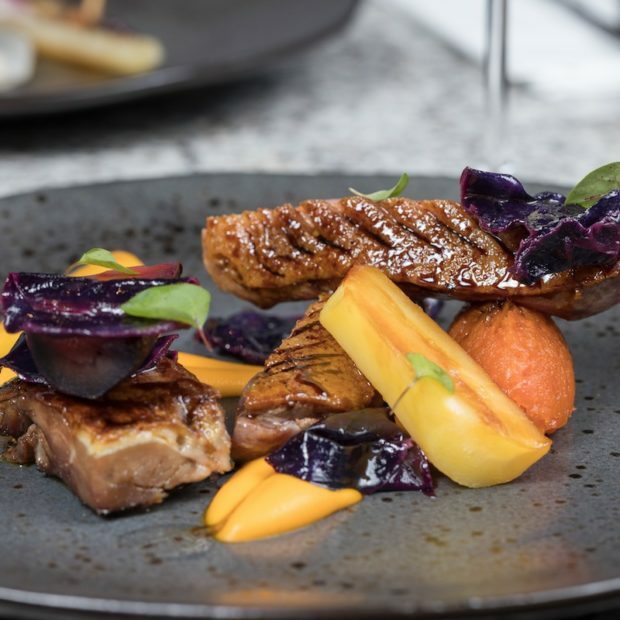 Highlights of the menu include the starter dish of pork cheek, curry, carrot, veloute – a nod to the restaurant’s name and Manchester’s scientific heritage comes as he completes the dish with a graphene crisp. Ben celebrates classical northern food with his version of venison, black peas, celeriac and leek, and a dessert of Eccles cake, currants, yoghurt, butter, tea. 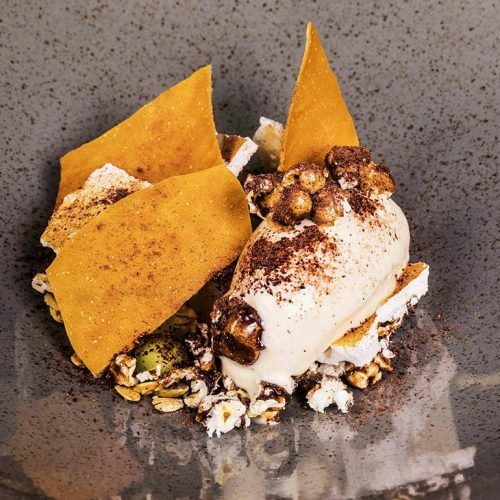 His love of Manchester music shows through in ‘Sally Cinnamon’ (named after the classic Stone Roses song), popcorn, nimixtilised melon, granola. 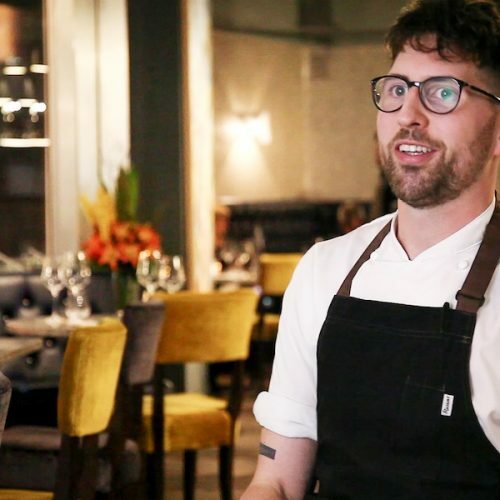 In addition to local influences and suppliers, Ben’s menu captures the finest ingredients from across the country, such as Lancashire lamb served with nasturtium, beets, black garlic, wool; duck from Goosnargh alongside asparagus, fennel, mushroom, and milk, rice pudding, with rhubarb from Yorkshire, and liquorice. 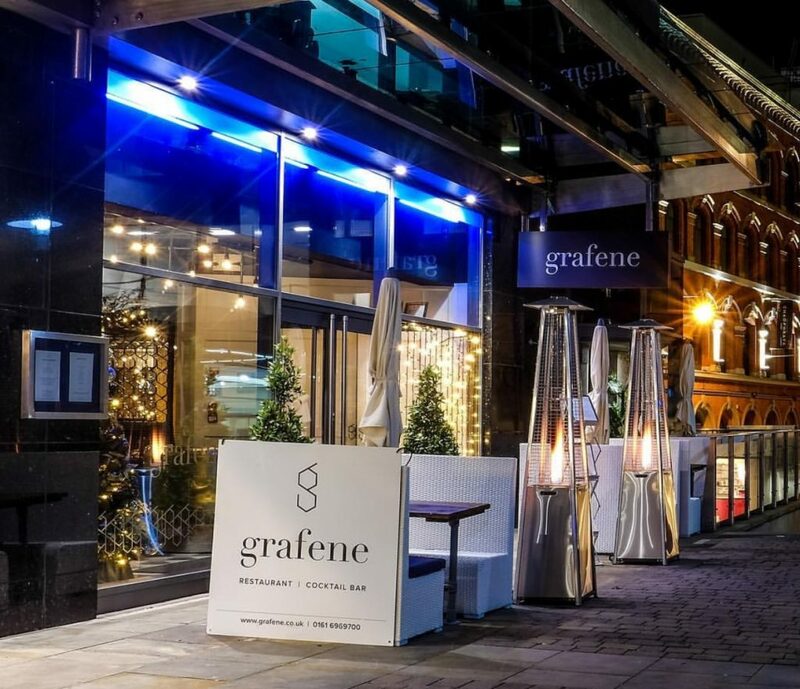 Grafene Restaurant, Manchester, boasts ‘uniquely British eating and drinking’ set in an urban backwater of central Manchester, near the grandiose Hotel Gotham. I say ‘backwater’ as my Google maps sent me past the side alley (or snicket, aisle or corridor, depending on where you are from) three times. Resulting in my falling into a men’s clothing shop owned by an ex-rocker from a local band of brothers, resulting in me buying a jacket I didn’t need! I enquired with the rather pleased shop assistant where the Grafene was and he responded: “Ah yeah, I know that, very good restaurant, great cocktails, it’s down there and up the alley!” And, so it was, just off King Street. Outside is modern, a bit cold and not visibly a showcase for British cuisine; hardly a farmers’ market. However, the tasting menu of the day on the board outside indicated otherwise. That was enough to entice us in. A somewhat warmer welcome at the door, coats and bags swiftly locked away and we were shown to our booth. However the journey was not that swift: For three blokes, the beautifully crafted nickel-topped bar offering a fine selection of premium spirits and Villeroy & Boch glassware caused some distraction. It was like a culinary ‘Man-cave’. If that wasn’t enough, the open pastry kitchen again took our senses away – I actually bumped into one of my fellow diners as neither of us were watching where we were going. The fresh-baked bread was already on our ‘must-order’ list! Beautifully-crafted leather booths offer elevated views of the city below; one storey up lends itself perfectly to voyeurism. Above the bustle of the urban shoppers below, we watched office workers, hairdressers and goodness knows what, each business framed by Grafene’s large, industrial statement windows. Who needs a countryside view when you can eat countryside produce and not get muddy? Service is slick, informative and unobtrusive. Menus simple, intriguing and consistent, and reassuringly bang-on season, and yes, as promised, British. But what was ‘Unique’? Each of us went silent, for quite some time. Then the noises: “Ooh that sounds good”; “That’s interesting”; “Have you tried this?”; “What’s that?”; “Ah yes!”. We could each have ordered every dish on the menu, so decided to vary. One consensus was ‘bread’. Dry January was collectively put on hold once we saw the wine list, an excellent and well-considered selection priced sensibly by the glass. Three English sparkling wines supporting the British ethos amongst a balanced world tour of other well priced temptations. Based on our menu selections we chose a Picpoul de Pinet. What a perfect way to interrupt dry January. Crisp, buttery and uplifting. Bread selection arrived. The mini sourdough loaf didn’t last out the butter. We gesticulated eagerly towards the pastry chef for more of both! Starters arrived shortly after. Cauliflower velouté, pickled and roaster cauliflower. A generous portion, delicate in texture deep in flavour. Torched Mackerel, artichoke purée, dill. Partridge, braised leg pastilla, pomegranate, salsify. Each perfectly and considerably presented. No fuss or ‘noise’ – ingredients for ingredients’ sake. Every element had a purpose; every purpose perfectly executed. Mains consisted of Butternut squash gnocchi, BBQ leek, spiced seeds. A brave choice for my heartily carnivorous guest, but his silence was indeed golden. Savouring every mouthful, and even sharing some. The perfectly poached fillet of cod caused debate on chef’s balancing of the delicate cod and perfectly steamed broccoli with the hearty seaweed butter sauce. My treat was Sea Bream, brown shrimp, sweet corn, charred leek, smoked mussels, langoustine bisque. January on a plate. Light, flavoursome and intense bisque. Desserts, not part of our initial plan, however needs must be overruled by wants! White chocolate cheesecake, clementine, pain d’epice ice cream kept my guest quiet for a long five minutes (on tasting, I could appreciate why). Chef also treated us to his creation of the day – chocolate delice, dark chocolate Aero, salted caramel, malt barley – that kept the rest of us quiet, almost. To manage to take our attentions away from the stunning decor and voyeuristic views was some feat. To impress three hard-nosed gourmands in January another. The service provided an informed presence without intrusion. The ingredients ensured simple flavours, perfectly executed. The setting was an enticement to return again on an evening to enjoy its industrial decadence. Certainly, as promised, “Unique”. Wines. Matching. By the range extensive. 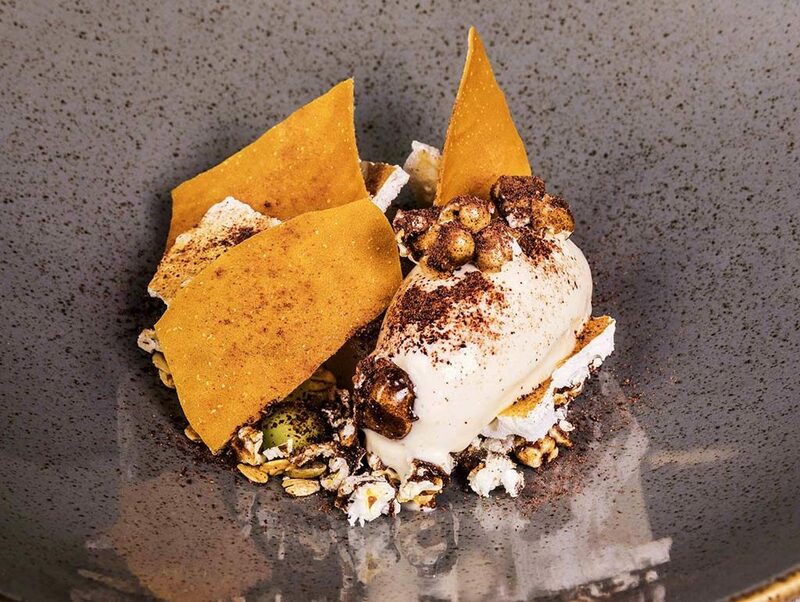 GourmetXperience eXclusive: Celebrate Executive Chef Ben Mounsey’s culinary creations. Fine, contemporary British focused seasonal tasting menus, coupled with welcome British seasonal cocktail or English sparkling and to conclude a complimentary British cheese selection.